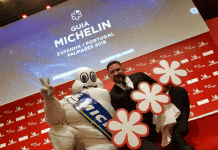 THE biggest and best event in the Jerez calendar is about to begin. 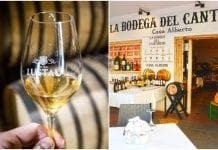 When you first arrive in Jerez, everyone will tell you about the feria. 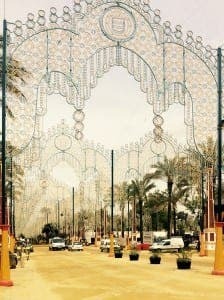 On my first day at work, back in October, I heard the phrase “you must go to feria” almost every minute. Sadly, this event doesn’t happen until May. Such is the reputation of feria, that jerezanos look forward to it all year round. It is the highlight of the year. 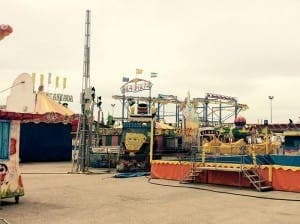 A collection of fairground rides and tents solely for the consumption of alcohol descend on Jerez for one week only. The first sign of its approach was the Jimenez lighting truck. It appeared a month ago just outside parque Gonzalez Hortoria, where feria takes place. The park lies derelict for most of the year. It is a space in the city reserved especially for Feria week. Bit by bit, the town hall put up the lighting and flattened the ground. Since last feria, pathways had become uneven. To rectify this earth was brought in and mixed with a special fluid. Workers spread this mixture evenly to form the paths. Then little by little the casetas, or feria tents, were put up. The ever slow construction rate accelerated last weekend. A fairground appeared as if from nowhere, complete with roller coasters, ferris wheel, dodgems, whatever you can think of. For those of you who are British, it’s as though Thorpe park or Alton towers has become portable and descended upon Jerez. All the rides are in place, all the casetas are ready, the paths are flattened and the booze has arrived. 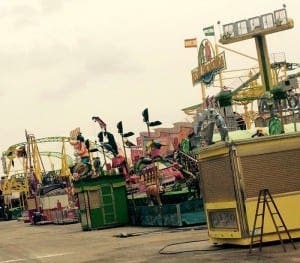 Walking through feria earlier, the only thing missing was people. There are rows upon rows of fairground rides lying vacant. Everything is ready.